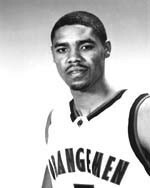 Jason Hart was a tremendous defensive player and four year starter at point guard for Syracuse. Hart was an exceptionally quick player, able to defend opposing point guards well. With his speed and ability to drive the lane, he was able to be a good rebounder for his size. Hart's weakness was that he was often reckless when driving to the basket, and was prone to offensive fouls and turnovers. He was never a consistent scorer, though he could drive to the hoop. Hart almost did not come to Syracuse. After he had enrolled, he attempted to back out of his commitment and instead considered west coast schools such as UCLA or UNLV. However, he eventually held to his original commitment. Hart would be a starter the first game his freshman year, replacing the departed Lazarus Sims who had graduated. The Orangemen would struggle that season to find the leadership lost by the departed Sims and John Wallace, and would go to the NIT. Hart would be named to the Big East All-Rookie team. With Hart, Etan Thomas and Ryan Blackwell on the squad together, Syracuse would start to develop into a tough defensive team. The team improved Hart's sophomore season and made it to the NCAA Sweet Sixteen. Hart was still inconsistent, though capable of making spectacular plays. Hart attempted to become more of a scoring threat his junior season, and he would lead the team in scoring. The net result was that his play making skills suffered, and the Orangemen struggled again on offense. Hart would earn Big East Third Team honors that year. Hart would help guide a balanced offensive team his senior year, and one of the top defensive teams in the country. He was still turnover prone, but Hart returned to his playmaking focus, and his teammates benefited. Syracuse would win the Big East Regular season title, and make it to the Sweet Sixteen in the NCAA. Hart would earn Big East First Team honors. He would leave Syracuse as the school's #2 all time assist man behind Sherman Douglas, and was the school's all-time leader in steals. Hart would be drafted in the 2nd round of the 2000 NBA Draft by the Milwaukee Bucks (with the 49th overall pick). He would hurt his back his rookie season and play only one game for the Bucks. Hart would be cut after the season and joined Asheville of the NBDL. Midway through that season, he was called up the San Antonio Spurs and finished that season in the NBA as a reserve. He was again cut, this time by the Spurs, so in 2002-2003 he played for Makedonikos in the Greek league. In 2003-04 he was resigned by the San Antonio Spurs and was a reserve guard for the season. He would end up with the Charlotte Bobcats the following season, and for the first time would have an opportunity to be a starter (for part of the season). In the 2005-06 season he ended up with the Sacramento Kings, where he again was a reserve. He was traded to the Los Angeles Clippers in the middle of the 2006-07 season, where he became the starting point guard for the remainder of the season. Hart would sign with the Utah Jazz as a free agent in 2007. He would sign with the Clippers as a free agent for the 2008-09 season, and play 28 games for them, before being traded to the Denver Nuggets, joining former Orangeman Carmelo Anthony. He would see reduced playing time with the Nuggets, but would make the playoffs. Hart would play for nine different NBA teams in his career: Milwaukee Bucks, San Antonio Spurs, Sacramento Kings, Charlotte Hornets, Los Angeles Clippers, Utah Jazz, Denver Nuggets, Minnesota Timberwolves and New Orleans Hornets. Hart would enter the coaching profession upon retiring. His first year of high school coaching was the 2011-2012 season where he coached Taft High School (Los Angeles) to a 29-4 record and the Los Angeles City Section Division I title. He then entered the collegiate coaching ranks as an assistant coach at Pepperdine University in 2012, and in 2013 he became an assistant coach at USC. Hart was the cousin of former Syracuse forward Howard Triche. Hart was named to Syracuse's All Century Team in 2000, and was awarded the Vic Hanson Award in 2011.